One hot sunday afternoon, the food fanatics travelled to the other end of the Kelana Jaya lrt line in a quaint little restaurant called Cagayan to sample a taste of home-- our much missed Crispy Pata, Sisig (with egg!) and pakbet. It was a artery clogging taste of heaven. Yummy! Worth every cholesterol and trans fat (or whatever fats) that will probably shorten my entire lifespan for a couple of hours or so. Met up with Jay and Tina at the Masjid Jamek LRT around 12nn and despite the heat of the sun, we trekked all the way to Bandar Utama to eat at the Pinoy restaurant. 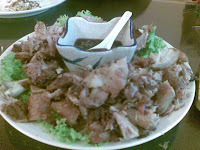 I was excited to eat my favorite Crispy pata which I have missed a lot. Tina ordered sisig (which is another yummy dish) and just to add some semblance of health on the cholesterol laden dishes we ordered, we had some pakbet. There was just something about eating something very pinoy when you're in a foreign country. I guess it adds more "specialness" to the act of eating something seemingly ordinary. We gobbled everything as if there was no tomorrow. Galit galit muna.. There was nothing to complain about the place. It was truly authentic. And for almost an hour there, I thought that I was actually in Manila and not in Malaysia. I just wish they had a honest to goodness authentic pinoy halohalo. I miss that. Kahit na yung chowking version lang.. But syempre the best pa din yung sa tabi ng kalye.. homemade.. with all the germs and bacteria. haha. After our hearty lunch we walked around a bit and did some window shopping. We then transferred over to nearby 1 utama where I finally managed to find my long searched size of crocs! After almost 2 years of searching I finally managed to find a size for me. Tina and I bought matching pairs. Unfortunately Jay didn't have a size in the design he liked. We were still full but we craved for some Mcdonald's Sundae for dessert so we searched for Mcdo and I had my craving for chocolate sundae filled. It was one long day. Going home we got stuck in the LRT station for about 15 minutes. The train just stopped and refused to budge. It was raining heavily so there must have been some technical glitch somewhere. It didn't dampen our spirits though. We were just simply too happy to spoil our day. I was excited to try on my new crocs. Tina couldn't wait anymore, she wore it as soon as she bought it. I got home barely having enough time to dress up for badminton. I had to burn the fats off so I was quite excited to play. I played 3 sets before I retired for the night.